Since Hastings Tramways Club was founded, we have been lucky enough to find three ex-Hastings Tramcar bodies which we are now trying to restore to their former glory. The first of our trams (no 43) was found at Winchelsea by Colin Smith, Charley Wheeler & Ron Leach in October 1985. Unfortunately, due to storage restrictions, no 43 has now been dismantled - the parts being used to help restore the other cars we have rescued. The other two cars (nos. 48 & 56) were found in March 1995 at Camber. 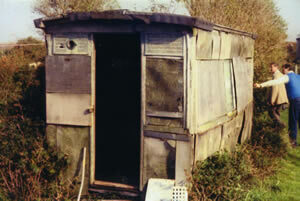 At the time they were found, they formed part of bungalow which was about to be demolished. Had we have not rescued them, they would have be lost forever. Photos of the trams in these early days can be found on our early photos page. After cars 48 and 56 were found in 1995, they were more-or-less on the move for 5 years. Initially, they were moved to a storage site on Quarry Farm, Bodiam in one of their buildings. This did not last long though and they soon had to be moved. After several weeks of searching, a site was found, ironically at the place they spent a significant part of their life - the Silverhill Depot. Although owed by Stagecoach and used as a bus depot at the time, they spent several years in the generating room of the building. Again, this arrangement was not to last and they had to be moved again, this time to the Eastbourne Miniature Railway. They were stored on their site in the open, wrapped in tarpaulins, for a couple of years. This arrangement was less than perfect and we were constantly searching for a more permanent and sheltered location. This finally came in 2001, when they were moved onto the Rother Valley Railway site at Robertsbridge. The trams spent the 12 years between 2001 and 2013 on the RVR site at Robertsbridge. This was a seemingly ideal site for us as it provided a regular flow of visitors and a real community spirit within the site volunteers. On-the-hand, the fact that the trams stayed on the site required us to help on the railway side of things whenever required, which we were happy to do, but did limit the time we have to work on own projects. At the RVR, we added tracks to one part of our site, which could be used to display our ¼ scale model tram on. We also made a walk-way behind the trams to allow visitors to view the trams from. We would have liked to have added a seafront façade to the inner walk of this, to give it an authentic feel, but we had to move before this was completed. 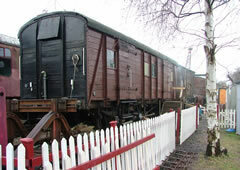 In 2004, we had an opportunity to purchase an ex-South Eastern & Chatham Railway PMV wagon for the sum of £300. We jumped at the chance as it gave a dry storage area for all our tools and equipment as well as a few layouts and other bits and pieces. The wagon was built in 1922 at Ashford, Kent to SR diagram 960. It was withdrawn from service by British Railways in 1988 and arrived at the RVR in 1995. During the RVR years, we worked on it to repair it and was in quite good condition by 2010. In 2012, we were given notice to leave the RVR site. This enabled the railway to continue with their development of the site, with the aim of eventually rejoining with the K&ESR. After another long hunt, a site at the Staplecross Shrub Nursery was found. To enable us to move, our PMV wagon had to be sold (to the Bluebell Railway) and tram truck (to the Brighton 53 Group). 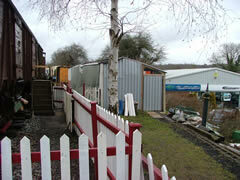 Our trams were moved to the new site on 4th February 2013. The trams are currently at Staplecross Shrub Nursery. Over the past years, a few members (namely Derek & Roy) have spent their Wednesdays and Sundays working on the trams when they can. As all our income comes from events and donations, this does limit the amount of work we can do. As we are new to the site, we currently have a limited amount of (sheltered) storage space. Hopefully we will be able to build a lean-to to try and keep the majority of the weather out. Now the tram bodies are located in a more permanent location, we will hopefully be able to properly work on them and make them look presentable and the site more 'visitor friendly'. We now have access to area of the site to do with more-or-less what we like.